I am going nowhere,” asserts British Prime Minister Theresa May with her trademark firmness. That is precisely the problem. She is not going anywhere in Britain with her Brexit deal. She meant she was not quitting over the uproar regarding her unpopular Brexit withdrawal arrangement from the European Union (EU). Struggling to please everyone, May winds up displeasing all. Critics say May’s deal is “rotten” because Britain must comply with EU rules until December 2020—probably longer. The fact is Brexiteers had sold a pipedream to the public, promising that Brexit would extract the advantages of being in the EU, while slamming the door on irritating responsibilities. May had loyally tried to extract such a deal from the EU. They slammed the door on her. May declares there are only three choices now: “This deal… leave with no deal… or no Brexit at all”. 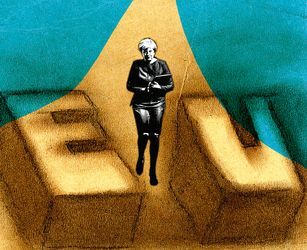 Dieter Kempf, head of the German Federation of Industry, warns, “A no deal, hard Brexit is disastrous for Britain and Europe.” European Council’s President Donald Tusk says, “We are also prepared for Britain to cancel Brexit.” May’s underlying message: Take my Brexit deal or reap chaos. No one is buying that… yet. Opponents claim no deal is better than abject surrender to the EU. A clique within the Conservative Party manoeuvres to topple May. The opposition parties drool over prospects of early elections. As different groups thrust and parry, wordsmiths delight in conjuring phrases like Brexit Wreckit, Brexit exit, Conservatives disMay and so on. But Brexit is no word play. It is a serious process that profoundly impacts Britain’s future for generations to come. EU’s Tusk tweeted, “I will do everything to make this farewell the least painful possible, both for you and for us.” After EU endorsement, the deal must secure approval from the fractious British Parliament in December. Given the opposition to May’s deal, it could be May Day for Britain. Politicians bombard the public with barbs comparing Brexit with World War II, inflaming emotions from fear to courage. Voters are now weary. Political consensus is destroyed, society is polarised and all are fatigued by the ceaseless fusillade of arguments. Fanning nostalgic memories of Pax Britannica and the era of the glorious empire, Brexiteers had trumpeted that freed from the EU’s shackles, Britain would find her rightful place in the world. That is happening. But Britons are discovering: It is not a good place.